A special edition of the legendary StingRay with a narrower neck profile and tighter nut spacing. 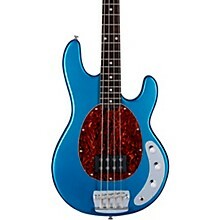 This StingRay Classic pays tribute to the “SLO Special“ Music Man StingRay bass. With its comfortably narrower 38mm nut and 9V powered Active 2-band preamp, this StingRay Classic brings an iconic look, sound and feel in all finishes. Featuring a 9v powered Active Preamp and individual Volume, Hi and Low “Cut/Boost” controls, StingRay Classic gives the player a no-nonsense, straightforward command over the tonal voicing of this StingRay bass. Our Sterling by Music Man bass bridge is modeled after the heavy-duty Music Man design, and features fully adjustable and intonatable steel barrel saddles for fantastic tone. They say looks aren’t everything, but with the classic finishes of Butterscotch and Three-Tone Sunburst, this StingRay Classic stands out on any stage with an iconic, vintage flair. 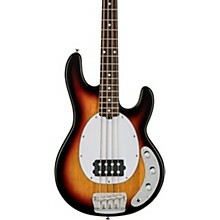 It's time to get on stage with one of the most iconic basses ever. Order today.